View of Notre Dame cathedral from far bank of the Seine River. Red-roofed buildings are visible to either side of cathedral behind trees in midground. 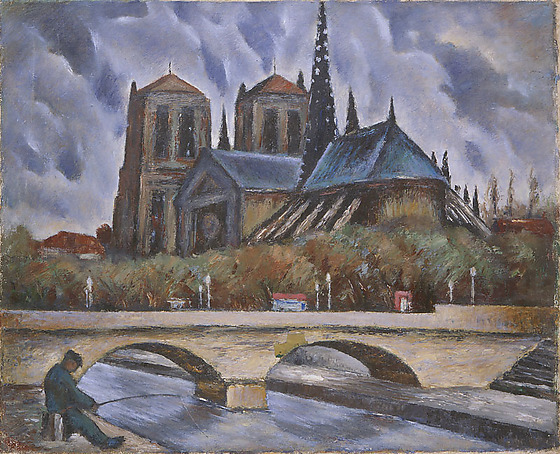 Pont-Neuf bridge spans image in foreground, with a seated figure fishing at bottom left. Heavy gray sky. This piece dates from Sugimoto's early period in France. 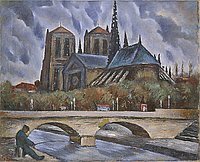 The influence of Post-Impressionism and Cezanne are apparent and notable in the expressionistic brushstrokes and abstract qualities of the bridge and water. Sugimoto's interest in architectural and architectonic structures is also apparent, and there is an interesting use of horizontals in the rendition of the strongly vertical Gothic structure.